Last summer I posted an image of the Gene Wiki hyperlink network, aptly titled "the gene wiki hairball". The image was picked up by noted artist/scientist Martin Krzywinski and used as an example of why hairballs are a terrible visualization. Perhaps out of guilt for making an example out of us and/or perhaps out of interest he has helped us improve our thinking about how to visualize networks substantially. 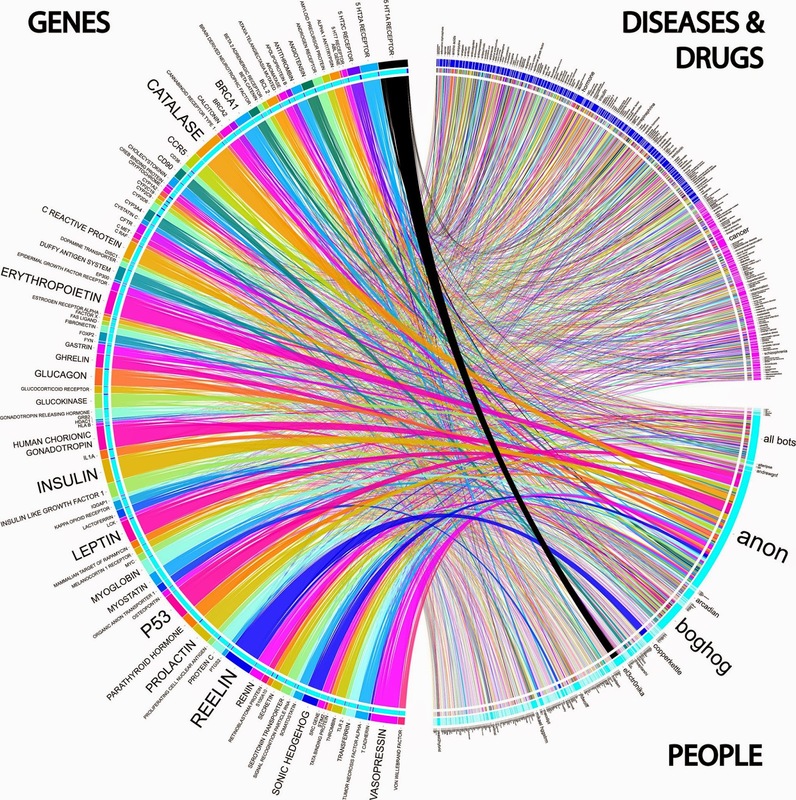 Here is a Circos view of the top 100 genes in the gene wiki, the editors that created the articles, and the diseases and compounds that the genes are linked to. It will be presented as a guerilla poster at ISMB this year so please stop by and have a closer look! Aside from bringing an artistic aesthetic to scientific illustrations, one of Martin's main contributions (IHOP) is that he understands and uses space to convey meaning effectively. In a hairball, the only consideration of space in the layout algorithm is to reveal as many nodes as possible. In a Circos diagram, place can be attached to semantics. This fundamental idea is used to an even greater extent in Martin's latest layout invention, Hive Plots. 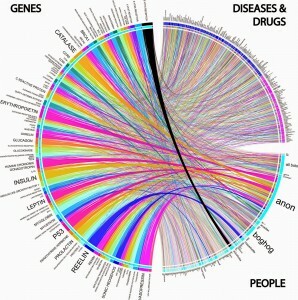 Watch out for the Gene Wiki Hive Mind visualization - or better yet, write to us and help us build it! Noun: An uninvited poster displayed at a scientific conference.